BVS Solitaire Collection is rated 3.9 out of 5 by 20. Rated 5 out of 5 by gamefan10 from Just what I was looking for! 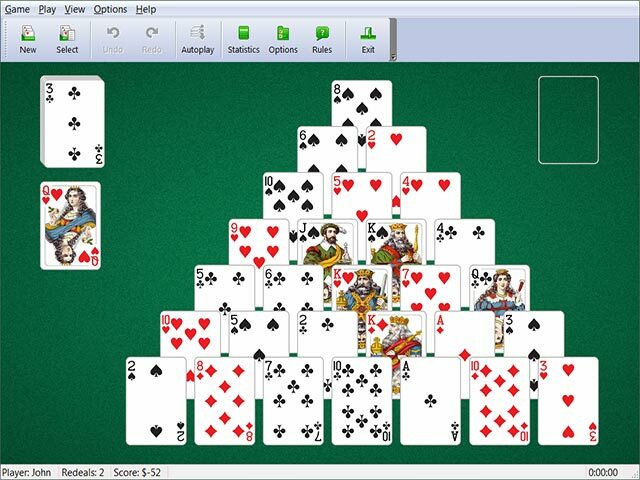 This is a great collection of Solitaire games. They vary from easier to more difficult. There are enough games to keep you happy for a long time. The rules of each game are explained, and once you understand the terminology that is used, the rules are clear. One very interesting feature that works with all the games is that you can change the rules of the game. For instance, some of the games have only 1 deal of the cards. If you don't win the game the very first time, it's over. But you can change that to give yourself a few more, or even unlimited, deals. Once you change a game, you save it with a different name, so your collection of games keeps growing! Solitaire is what it's always been, a way to entertain yourself your a little while, not hours and hours. This is a perfect collection of solitaire games and I'm very glad I bought it! Rated 5 out of 5 by carbyville from A lot of Fun! I really enjoy this game. There are so many different options for play that you'll likely never get bored. I was so pleased to see my favorite, Spider Solitaire, included with the game, plus many other versions of Solitaire that I've never heard of. I also love the customizable features of the game. It really makes for a unique experience for each person that plays. Rated 5 out of 5 by lisabarben from So Many Options OVER 400 Types!! I like playing solitaire and it kills time when I am bored or it is slow at work, but this BVS Solitaire Collection is AWESOME!! I haved the full version on my laptop and am thoroughly captivated!! All of my favorites like Spider Solitaire, Scorpion, FreeCell, Pyramid, Forty Thieves, Carpet, Cruel etc. are included. The full version of BVS Solitaire Collection lets me customize the games the way I want to play!! I can change the design thee games and customize the card sets, card backs and backgrounds. I have yet to play the same solitaire game twice!! I highly recommend that you buy the full version so you can see what I mean!!. Disclosure I received this product at a discount for my honest review and highly recommend!! Rated 5 out of 5 by APriv2015 from Interesting Solitaire Collection This collection of solitaire games has been fun so far and not that difficult. I was very surprised with how many different games was on this one collection. This game has kept me entertained for hours so far. The only issue is that the background is a typical background for most solitaire or other card games. There needs to be a better background or even 3D type of a background. However,I would recommend this game to anyone who enjoys any kind of card or board games. Rated 5 out of 5 by paddwellynn from BVS Solitaire Card Games Absolutely love this game. 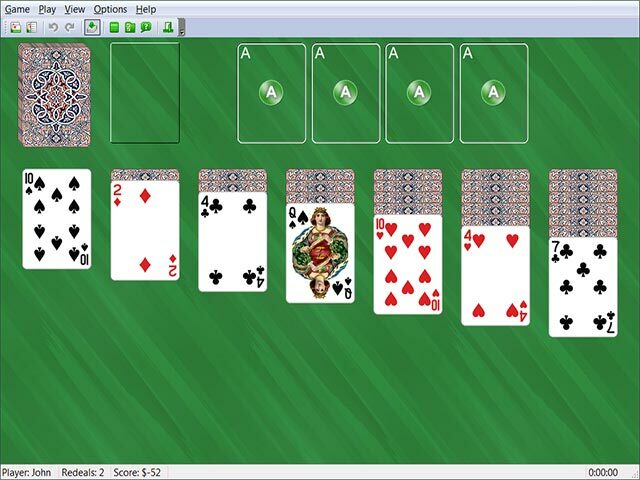 The only game of cards needed on a computer. Love the challenge of the harder games and the ease of the easier games that just fills in a bit of spare time. Haven't yet tried them all. Get stuck on the favourites. I have even given this game to friends as a gift. They also love it! Would like to have the updates that I got on the old pc for my new pc though. Some good games on that like Adela and Australian Patience and Austerli? something. Love these three the most. Rated 5 out of 5 by VirginiaPat from Great card games! I've had this game for 3 years, at least, and I still enjoy playing. It takes a few minutes to learn each game, but once learned, the games proved hours of fun. I like the fact that each game is marked "easy" and "difficult," and my 2 all-time favorites are Diplomat and Josephine. I like to try to beat my previous 100-game score. Rated 5 out of 5 by magfan from The best solitaire game offered at Big Fish The current version of BVS Solitaire offers more than the 385 varieties indicated in the Big Fish description. There is an Undo. There is a hotkey shortcut for a Hint. You can choose any solitaire variant you wish right from the outset -- no "unlocking" nonsense. One feature that I haven't seen in other Solitaire collections is the ability to tweak the rules, creating your own variants (you save your tweaked version under a different name). 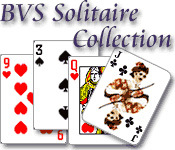 BVS Solitaire has been updated since some of the other reviews indicating technical problems. I can't say that all the games work properly on all computers, but I've never had a problem with crashing on any of the solitaires that I've played. I have had irregularities with the Autoplay going off when I didn't want it to, but that seems to fix itself after a few moves. 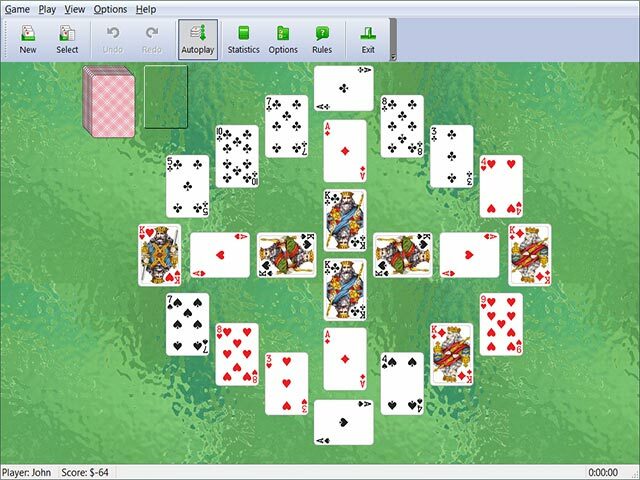 Most solitaire games offered by Big Fish are variants of simple card matching, with a pretty background and music, often with some sort of "story" tacked on or "levels" limiting what games you can play. This one is serious solitaire. It allows you to choose, or even to add your own backgrounds. It has several attractive card faces to choose from. It's not the highest resolution game out there, but it doesn't look bad on my 24" monitor. It allows you to mark your "favorite" solitaire games for quick reference (useful when there are over 400 possibilites to scroll through). It has a multitude of other configuration options, but the most attractive option to me is the ability to tweak the rules. Rated 5 out of 5 by funandgames3 from First and Best This is the first game I bought from Big Fish years ago. It is the only one that I keep in my game manager always without deleting. I play whenever I have down time and love it. The best value at Big Fish. Rated 5 out of 5 by Boomer1097 from Excellent Game I love this solitaire collection! There are lots of different games from which to choose. The game play is smooth. You can select your background and card style. The favorites list is nice. Once you have it populated, you can easily find your all time favs to play. The hint system is a nice feature. I'm thrilled with this game!